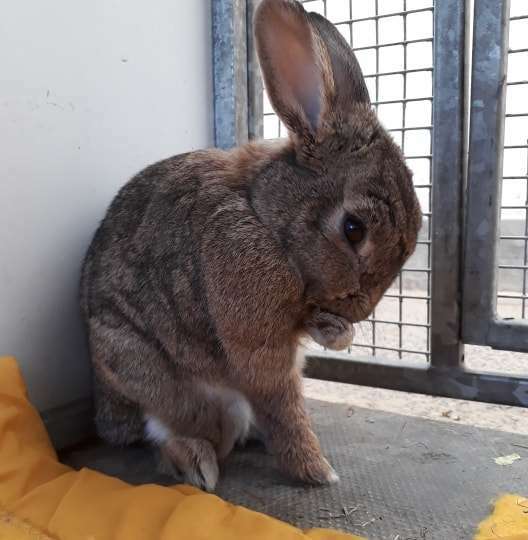 Poppy is a beautiful brindle/brown coloured female bun at approximately 4 years old. Poppy came to the sanctuary originally in 2015 at 10 weeks old with 4 other siblings. Poppy was re-homed to live with a neutered male companion, and did so for those four years, however unfortunately her male companion passed away, resulting in Poppy returning to us here in the sanctuary. In an attempt to find Poppy a companion, we had bonded her with Bruce. The bonding started very well, and Poppy perked up in behaviour! Unfortunately a few days into them being together, they had a bad scuffle and had to be separated. Poppy is looking for a quiet male friend to bond with. She would also love a spacious home to run about in and investigate! If you feel you could offer Poppy a home with a neutered male companion, please call up to the sanctuary, speak to the staff and fill out an application form!